Easy paleo chocolate cupcakes with a dye free strawberry buttercream made with freeze dried strawberries. You ever get the feeling that you’re just one giant contradiction, or is that just me? Yesterday my spiralizer came in the mail and I feel like a kid who just got a new toy. I’ve been happily transforming the contents of my kitchen into perfectly spiraled ribbons left and right. If I keep it up I’m going to find myself buried alive in a mass of zucchini noodles and sweet potato fries. Recipes to come. I feel like my excitement over a kitchen appliance and the thought of all the vegetables I get to eat is a real mark of maturity. Look at me being an adult. I found myself bored and awake at midnight last night (this morning?) so naturally I decided it was as good a time as any to make some cupcakes. Actually, scratch that. First I made onion bhaji’s with my fancy new kitchen appliance, then I accidentally made strawberry margarita ice cream, then I moved on to the paleo chocolate cupcakes. How do I not weigh 5,000 pounds? I decided to use the chocolate hazelnut cake that I made for Mike’s birthday last year as the base for these cupcakes. The recipe itself is essentially the same with just a few alterations. All you need is one bowl and an electric mixer. Just 10 minutes of prep work and about 15 minutes in the oven and you’re well on your way to perfectly moist and fluffy paleo chocolate cupcakes. The strawberry buttercream is actually a recipe that I found on Honest Body who got it from Urban Poser. If you want a dairy free paleo version of this butter cream go check out Jenni’s version because she uses organic palm shortening in place of butter. 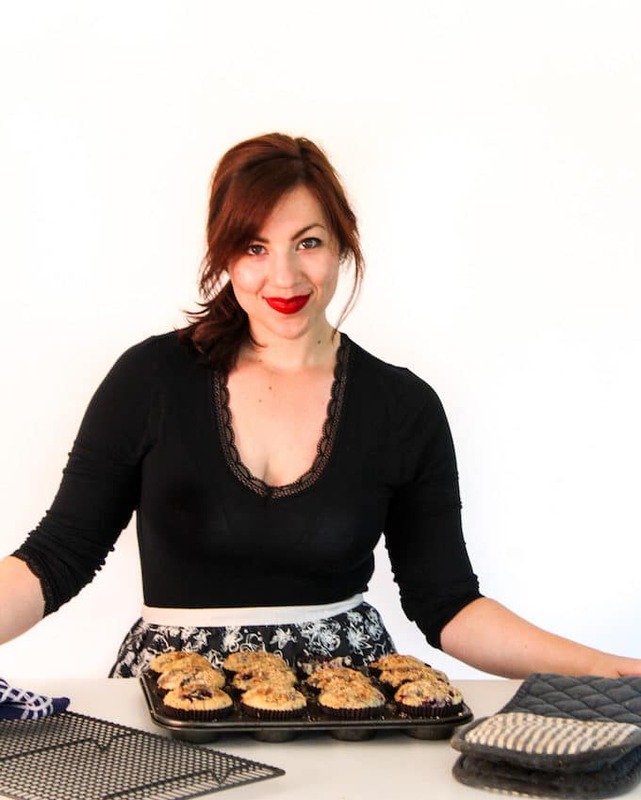 Also, you should go and check out her blog in general because she has the most beautiful recipes. Since I can get away with using a bit of dairy every now and then with Mike I decided to use butter instead of palm shortening because it’s much more accessible/affordable as an ingredient. Also, what’s a buttercream without butter? Instead of using red food dye to get that soft, pink color this recipes uses blended up freeze dried strawberries. Just measure out a cup and blend it up until the freeze dried berries turn into a powder. Easy. As far as the decorations go you can get as creative as you’d like. With Valentine’s Day coming up a heart/love theme seemed like an obvious choice. I used this video to learn how to make chocolate decorations a long time ago and now it’s one of my favorite cake decorating techniques. If you’d like to give the chocolate decorations a go, it’s easier than you think! Begin heating the oven to 350°F/180°C. Line or grease a cupcake tin and set aside for now. In a large mixing bowl and the eggs, coconut milk, honey, and vanilla extract. Mix on high until everything is incorporated for about a minute. Next you're going to add all of your dry ingredients (flours, baking powder, and cocoa powder) to the mixing bowl and beat together for a couple of minutes until no lumps remain and everything is mixed together. Add the freeze dried strawberries to a blender or food processor and blend until it becomes a powder. Sift the powder to remove the seeds and add it to a mixing bowl along with the butter and honey. Blend on high for a few minutes until the frosting becomes whipped and creamy. Frost the cupcakes after they have completely cooled. 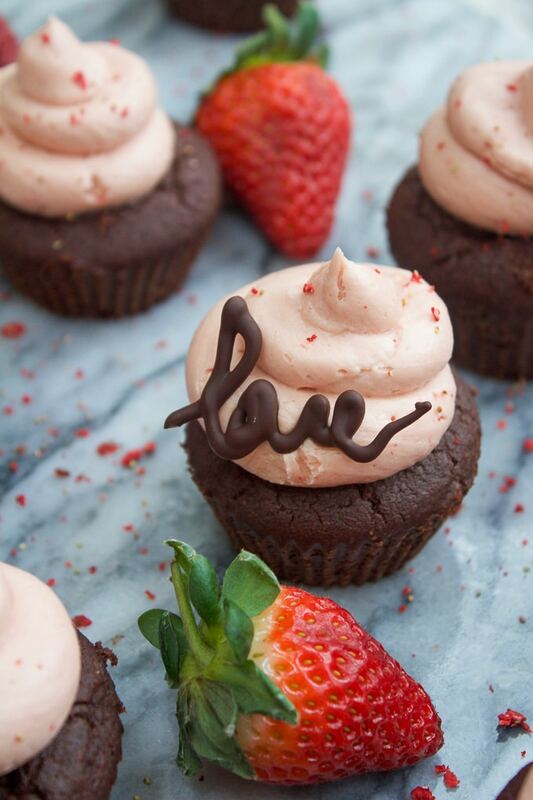 Sprinkle any leftover strawberry pieces, garnish with chocolate decorations (link to video tutorial in the post), and/or top with fresh strawberries. It's especially important to preheat your oven properly when baking cupcakes. Don't be tempted (as I often am) to skip the preheating time because it will effect that rise and quality of your cakes. Also, avoid peeking in the oven too soon because the cold air can also affect the baking process resulting in dense, sunken cupcakes. 1) can the frosting hold up in a hot weather (87F indoor, no air conditioning, I live in a tropical country)? 2) Is it possible to frost the whole cake 1 day before the event n keep the frosted cake in the fridge? 3) Is the amount of frosting enough to frost a 7” cake? Just needed to be a decent layer of frosting. Thanks so much! Hi Connie! This is just like a typical buttercream so it does keep its shape pretty well, but I wouldn’t necessarily recommend letting it stay out in the heat too long. If you can keep the cake in the cooler as you mentioned in your other comment that should be no problem. Frosting it the day before is also fine – that will also help keep the cake itself a little more fresh! As for the amount – this should also be enough to frost a 7″ cake. Hope that helps! I’m not sure I did it right! Help! I made the cupcakes tonight and they don’t seem sweet. I used vegan butter and water. Is it normal? Also, I can not get palm shortening in time for our party so I used the vegan butter again, for the icing, not sure that’s good ether. Any ideas. What would the oven temperature and baking time be on these, when making them as miniature cupcakes and one large cupcake and cupcake topper in silicone baking pans? Also, were there issues with the texture in these, them rising properly, etc? I’m also making vanilla cupcakes soon and the recipe I found for those requires the coconut oil to remain liquefied or else the cupcakes don’t rise properly and are very dense. Hi Cheyenne! I combined your two questions to just one so you don’t need to look through the thread to find the other answer. I haven’t made these as miniature cupcakes but usually for turning regular sized cupcakes to mini you just need to reduce the bake time. These will probably only need about 10-12 minutes. It’s hard to say for the larger cupcake because I’m not sure how big that tin is but you can try leaving them in for a longer time and check for doneness by inserting a toothpick into the centre of the cake until it comes out clean. As for the coconut oil – I know what you mean because I actually have another muffin recipe using coconut oil that needs to be refrigerated in order for the coconut oil to solidify. You don’t need to worry about that with this one! I’ve never had that issue with this recipe – I just melt the oil and mix it in with no problem. I’m not sure about coconut oil – I haven’t tried it and it’s not something I see many people do. I’ve seen people use palm oil in place of butter in dairy free/paleo recipes. This might be one that you could try – if you wanted the strawberry flavour you could always just mix it into that recipe. Not sure if you like dairy free butter, but you could always use that. Hope that helps and I hope you like the cupcakes! That would still work! I actually adapted this recipe from one that is baked as a cake https://www.asaucykitchen.com/chocolate-hazelnut-cake/ You bake it at 350 for about 45-50 minutes and you’ll be good to go! Thanks, Oana! Hope you like them! Your creative juices were flowing so late (early?)! These are so pretty! How nice that there’s no dye — loooove the idea of freeze dried strawberries. Oh my! do they look decadent or what? Perfect for Valentines Day! These are soooo cute!! I can’t believe they’re paleo! I too have used freeze dried strawberries in a frosting. They are expensive…but totally worth the flavour they produce. Ha, your late-night cooking adventures had me cracking up! These looks amazing! I’ve never tried using freeze-dried strawberries in my baking, but they gave your frosting such a lovely color, I might have to try it. Was the strawberry flavor very strong? It’s never a dull night when there’s baking involved! As far as the strawberries go I thought they gave off a lot of flavor which I was pleasantly surprised about – you should definitely try it out if you get the chance! Absolutely amazing! 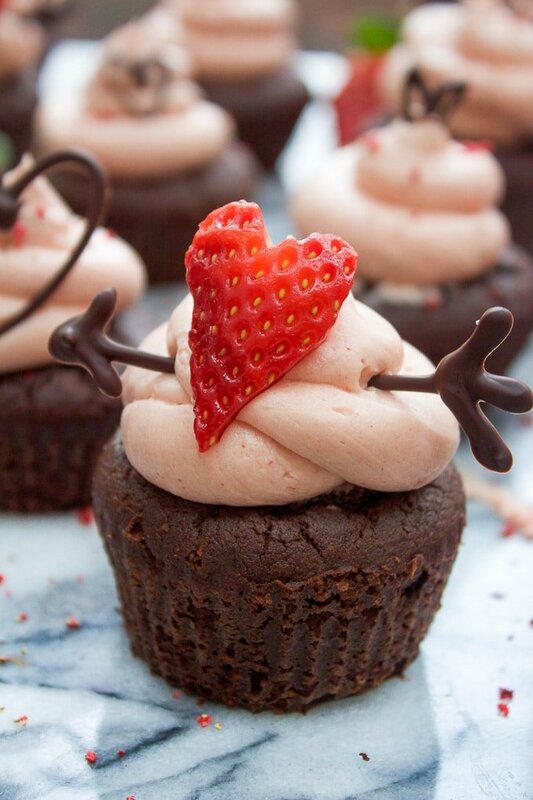 I love those chocolate decorations, they really take this cupcake to another level of cute! Ok Cupid , you can bring it ! These are perfect, beautiful and delicious ! Oh my gosh, these are gorgeous!! 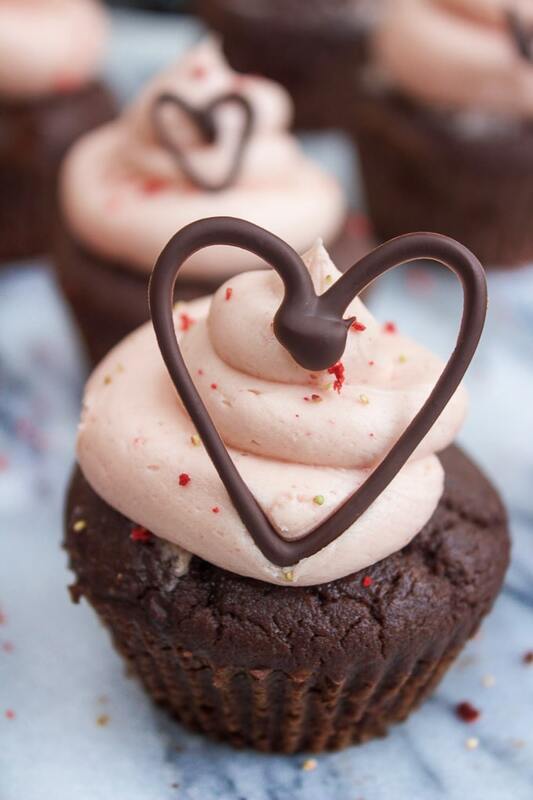 The piped arrow and strawberry are perfection, such a cute idea! I’m so keen to try these paleo cupcakes, Sarah! I’ve actually never seen a paleo cupcake recipe before, so am eager to give them a go. They look so adorable with the strawberry buttercream and chocolate hearts and arrows. Perfect for a paleo-licious Valentine’s Day! !